ProShow Gold for Windows XP - a program for creating animated slideshows. 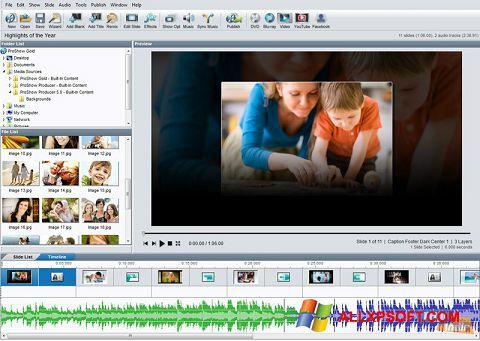 The application supports importing custom video, photo materials, connecting audio tracks, the imposition of transition effects and text comments. The editor uses its own library of filters and textures, contains a set of tools for editing the color gamut, parameters of brightness, clarity of each slide separately. The program includes a converter of output formats and the function of burning CDs, supports drag and drop technology and the ability to save personal templates for new projects. You can free download ProShow Gold official latest version for Windows XP in English.